You can experience many things in Bhutan, including snowy mountain peaks, hidden jungle, endless forests, dzongs, lavish monastery-fortresses, or a generally festive atmosphere. Nestled at the foot of the Himalayas, this ideally located destination will undoubtedly seduce you with its exception landscapes, architectural treasures and lively cultural traditions. It is possible to trek or participate in sporting activities throughout its steep mountains, broad valleys and dense forests. Crystalline lakes are scattered throughout the country. These offer rafting, kayaking and fishing activities. During your hikes, do not hesitate to wander through the doors of dzongs and temples to fully immerse yourself in Buddhist traditions. If you are lucky, you will be able to experience the traditions of tsechus which are spectacular religious holidays. 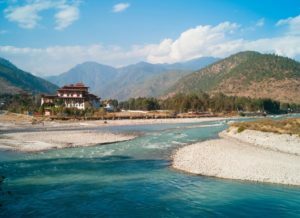 Whilst the climate is varied, a good time to visit Bhutan is from the end of September to November during which the temperature is pleasantly mild. Last Updated: August 31, 2018 16:28 ESTThe Health tab was updated - travel health information (Public Health Agency of Canada). Nestled between India and China, Bhutan still has one of the worst-performing health systems in South Asia with regards to its health system, despite the government’s effort to provide residents with free care. The country suffers from large disparities, serious shortage of qualified medical personnel and lack of modern facilities. In large populated cities like Thimphu and Paro, reasonably reliable medical centers like Jigme Dorji Wangchuck National Referral Hospital are accessible, but fees are expensive. In rural areas, access to basic health care is very limited or even non-existent. Ambulance services are slow and inefficient, yet can be reached at 112. Is Bhutan Safe for Travel? Do I Need a Visa to Visit Bhutan? A visa and a passport are required to enter Bhutan. Your passport must be valid for at least six months beyond the time of entry. Make sure to arrange your visa clearances and travel plans via an authorized travel agent. These measures must be confirmed before departure. Please note that this is the website for the Canadian High Consulate in India. There is no presence of a Canadian government office in Bhutan.